I’m sharing it again here because I think that having prints of the images you love is such an important thing, and so many people either don’t realize this, or take it for granted. I grew up thinking that going to Sears Portrait Studio and picking out a few 8×10’s were what family portraits were all about. I had no concept of custom portrait photography or the value that it holds. When my husband and I got married in 2006 I still hadn’t learned to value professional photography. We chose our wedding photographer based on price and whether or not we’d get a digital copy of our images. As a result we didn’t ever order a wedding album and we never printed anything larger than a 4×6 from those images. Later on, when I started to learn about photography and all of the amazing wall art that can be created with photos, I really really wanted to have something like that for myself and my family. There’s one embarrassing moment in particular that I will probably never forget that really drove home the desire I already had to have photos taken. I was sitting with a client trying to help her sort through which photos she would hang in her home. Having seen my home, she asked me point blank, “Well how come all you have on the wall are 4×6’s in a collage frame?” I had no idea what to say. I was embarrassed, humbled and ultimately realized that I myself hadn’t even learned the very lesson that I was trying to teach my clients. I knew it was time to make a change. I started saving up, knowing that I wanted our photos to be special and I had my heart set on getting a canvas. I kept an eye on quite a few of my photographer friends and finally decided I wanted to work with Alyssa Michelle (This was prior to her making the switch to shooting only boudior photography). I talked a little about the experience in an earlier post that you can find here. Picking our canvas was easy. I knew EXACTLY what I wanted. 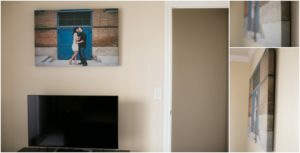 But then, we quickly realized that the canvas would look better in bedroom and we’d still need something to fill the wall space behind our couch. 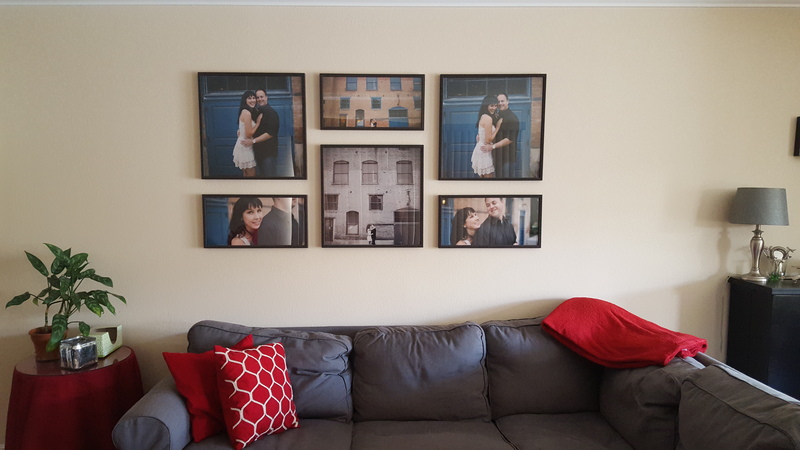 We ended up deciding we wanted one of the frame clusters that I offer to my clients, and after hours of arranging and rearranging layouts I got in touch with Alyssa to order our prints. Back then, I had no idea how much those prints would later mean to me. Alyssa also let me know that our purchase at the time would also come with a digital copy of all the images from our session. At the time, I was excited about this. Something in me thought that I needed to have all of those images. Not too much later and our canvas as well as our prints and frames arrived. Hanging them made for an interesting afternoon (we are both crazy perfectionists), but it was definitely fun! Now over a year has passed since those prints arrived and like I said in my initial social media share: This wall art makes our house a home. We enjoy these photos every single day of our lives. How often? EVERY. SINGLE. DAY. Do you want to know how often I look at the rest of the images? I don’t. I had a relative ask about them a couple of months ago and I dug them up from my hard drive to share. As I was flipping through the pictures, it dawned on me that I had completely forgotten about most of them. I wasn’t enjoying them. They weren’t bringing any added value to my life to have them stored on my hard drive. It had been a whole year since I had even looked at them. Print what you love and what you enjoy. Don’t make the same mistake so many others have by letting your favorite moments waste away on a hard drive at the risk of ending up accidentally erased, lost or corrupted. Digitals don’t last forever. Last, honestly ask yourself, when was the last time you flipped through your own Facebook photos. It’s probably been a while. Whether it’s a photo you took yourself and especially if you paid someone to photograph your family, PRINT IT. ENJOY IT DAILY, not just once a year. I agree! My mom told me once, “Kate- you can’t just decorate with pictures everywhere”. Ummmm- yes I can!